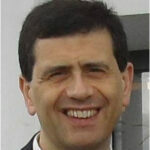 Alberto Bocca received the B.S. and M.S. degree in Electronic Engineering from Politecnico di Torino, Italy. After working in automotive companies, he joined the EDA Group, Politecnico di Torino as Research Assistant. His interests focus on low-power VLSI design, with particular emphasis on CAD solutions for clock tree optimization and leakage-aware design, and also on electrical energy storage devices, especially in application of photovoltaic systems, electric vehicles and smart grids.